Throughout his career John Peto was overshadowed by the success of William H. Harnett, to whom many of his works have been attributed. Peto met Harnett during his years of training in Philadelphia, after which he spent most of his life living between Toms River and Island Heights. 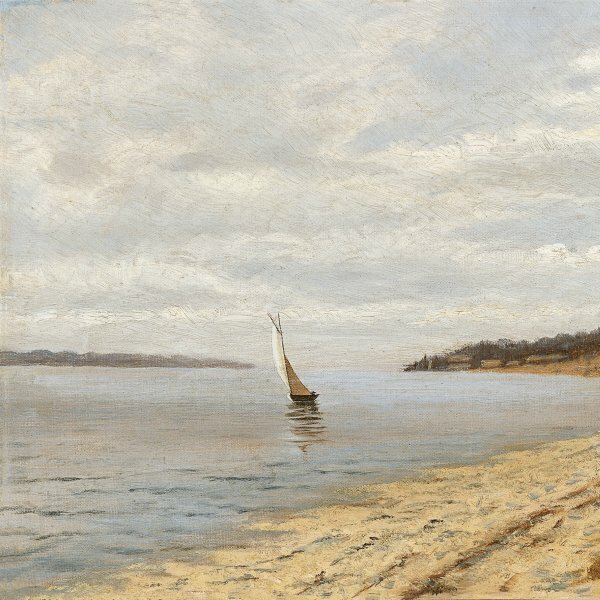 It was in these locations that he was primarily active and best known, and his works hung on the walls of almost all the local homes and clubs according to one of the obituaries published after his death. Books, Mug, Pipe and Violin is an early composition that is directly inspired by those of the popular Harnett. Peto’s inclusion of a violin in his still life refers to his great love of music, while the books were from his own library. The torn and split book cover on the edge of the table refers to the passing of time and to the frequent use made of these objects. 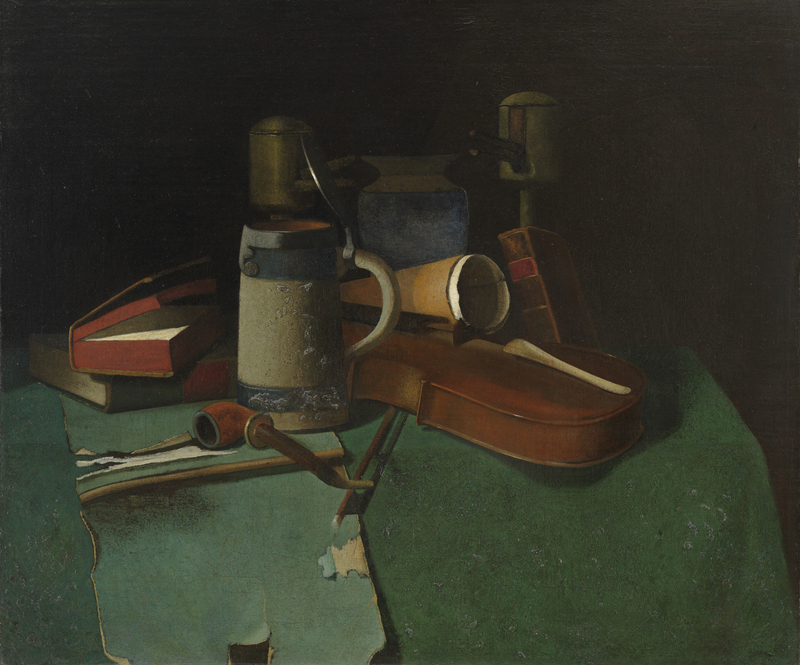 Books, Mug, Pipe and Violin is among the paintings that John Frederick Peto managed to sell to one of the few collectors of his work, his Island Heights neighbour James Bryant. It subsequently passed to the latter’s daughter, who was married to Howard Keyser Jr, and from them to their son James Keyser. 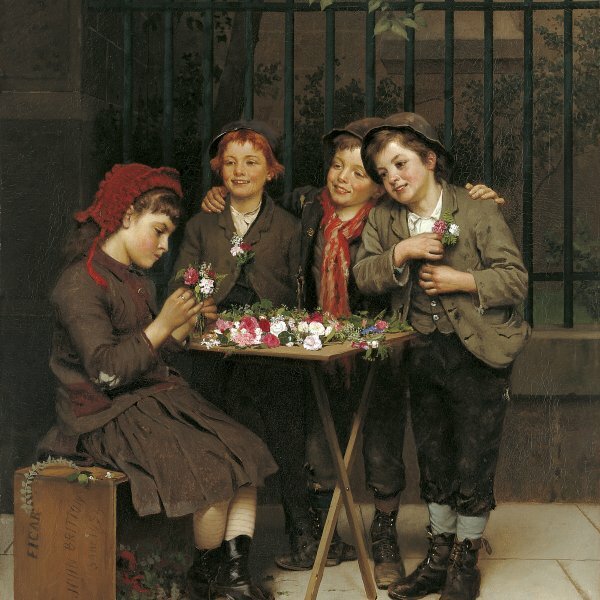 It is one of the first works to display the influence of William Harnett’s still lifes on Peto. Although it is very obvious today that the only similarities between the two were iconographic, and that they showed clear stylistic differences, until an article by Alfred Frankenstein rescued Peto’s oeuvre from oblivion in 1949 many of his paintings had in fact been attributed to Harnett. The violin, mug and books depicted in this composition are very common motifs in this genre, but in Peto’s painting each holds a special significance, as the objects portrayed in trompe l’oeil fashion in his works always mask a certain nostalgia. For example, his love of music is reflected in his fascination for the violin, an instrument he played from boyhood and one of his favourite objects. However, as John Wilmerding points out, the beer mug and the pipes were not personal objects of the artist and their inclusion in the painting is an ironic reference to the small Methodist town of Island Heights, where Peto spent the last eighteen years of his life and where smoking and drinking were frowned upon. What is more, the dark colours and hermetic nature of the composition reflect the isolation of his voluntary retreat, but also provide a faithful image of America in the second half of the nineteenth century.